Construction continues at a rapid pace on The 606 and its Bloomingdale Trail. The trail is expected to open sometime this fall. In anticipation, we’re evaluating whether Logan Square residents will have a safe way of getting there by bicycle. Today, we take a quick look at the trail access point at Drake Ave (3550 West). The trail will have one access point on the west side of Drake Ave. Where it crosses the trail, Drake is a one-way street pointing north. However, two blocks north of the trail, at Armitage Ave, it becomes a one-way street pointing in the opposite direction. So, whether cyclists are headed away from or toward the trail, Drake will force them to turn at Armitage or before. The map above shows the area around the access point at Drake. 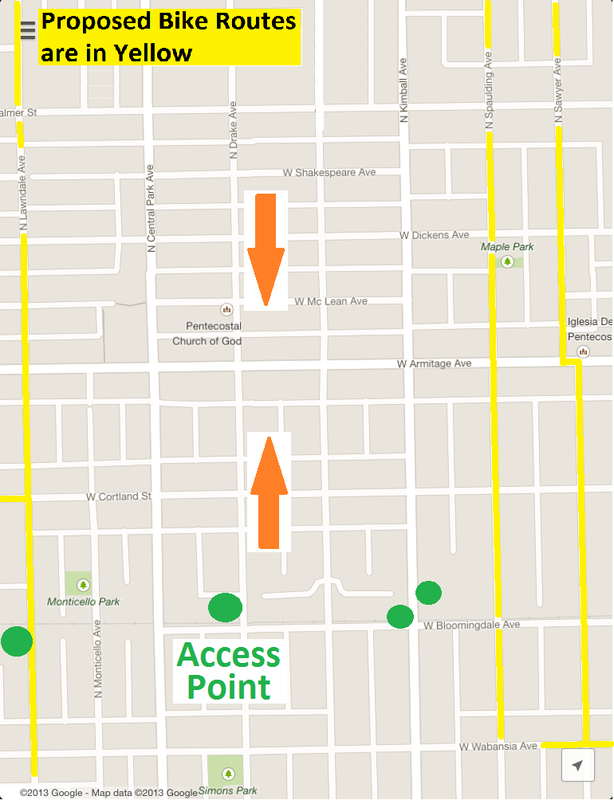 The access points at Lawndale to the west and Kimball to the east are also visible. The routes in yellow are bike routes that have been proposed by the city in its Streets for Cycling 2020 Plan (pdf). 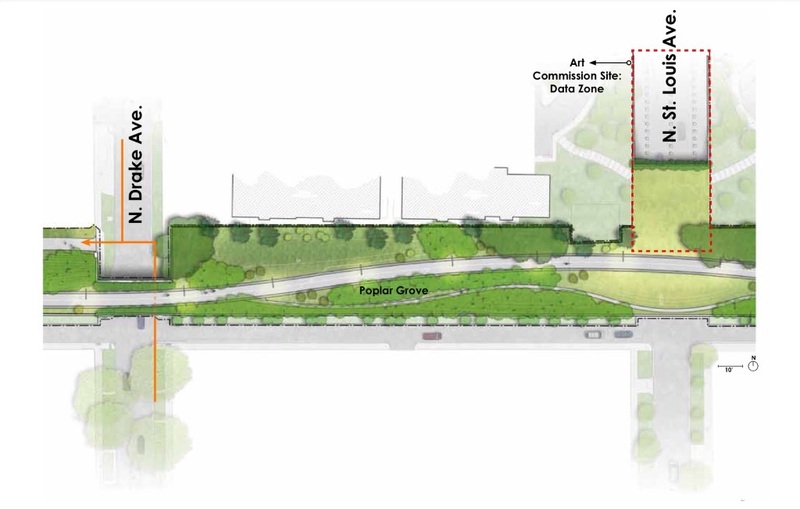 Drake sits in an area between proposed bike routes — routes that will be better connected to the Bloomingdale Trail via other access points. This fact, in combination with the fact that Drake is a flip-flopping one-way street, means it likely won’t serve many cyclists. If Drake were to become a dedicated bike route, one option would be to make it a contraflow neighborhood greenaway, similar to what is being planned for Wood St. in Wicker Park. A connection to Palmer St — which is an important proposed east/west bike route half a mile north of the trail — would be valuable. However, it may make more sense to focus on the bike routes to the west and east (Lawndale Ave, Spaulding Ave, and Sawyer Ave) that are part of the Streets for Cycling 2020 Plan. Contact your alderman and tell him/her that you’re excited about The 606, and want to be able to access it safely. Ask him/her to ensure that Lawndale, Spaudling, Sawyer, and Palmer become dedicated bike routes in keeping with the Streets for Cycling 2020 Plan. Here is a map of Logan Square wards, including the 1st Ward (Joe Moreno), 26th Ward (Roberto Maldonado), 30th Ward (Ariel Reboyras), 31st Ward (Ray Suarez), 32nd Ward (Scott Waguespack), 33rd Ward (Deb Mell), and 35th Ward (Rey Colón). It works fine for pedestrian access, though — moms with strollers can get up that ramp fine from the sidewalks. Agreed. It’s great that there will be an access point here. It will serve a lot of nearby residents. But cyclists coming from a bit further will likely use other access points.